After reading Christopher Gray’s column in this morning’s New York Times it occurred to me how the presence of the memorial raises larger questions. What tragedies deserve commemoration? 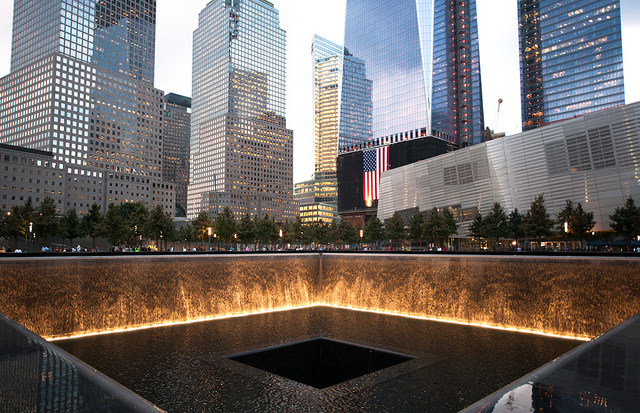 Are they the ones that spur outrage, ooze historical heft, or provide a return for their investment (the 9/11 museum touts a hefty $24.00 admission fee, one I doubt most New Yorkers—the ones who felt the stab of those errant planes most acutely—will pay)? Does the faction that shouts the loudest (the 9/11 “cabal” composed of families of the deceased got it done, but their sheer multiplicity of voices complicated the process) win out? If outrage is a barometer, then we’ve fallen short. I was reminded of this watching HBO’s recent broadcast of The Normal Heart. The movie, based on Larry Kramer’s stage play (some call it a polemic, a undeserving diminishment of a work that rivals—and surpasses—Ibsen’s An Enemy of the People) depicts our city in the early days of the AIDS epidemic. Directed by Ryan Murphy, it’s a moving snapshot of the medical brushfire that stoked not only NYC, but also other major cities across the country. The film brings an immediacy to the story that the play never could (though I missed a device used in the last stage revival—the projections of the names, and numbers, of those who passed all but coated the set’s back wall by the end of the evening) and its performances by Mark Ruffalo, Matt Bomer and Jim Parsons, to name but a few, are matchless. But The Normal Heart is also a searing reminder that body counts by themselves don’t justify erecting a plaque. By the early 1990s over 40,000 New Yorkers had died of the disease. In a more forgiving time, many of them might now be receiving accolades for lifetime achievement, or a least a key to the city: Arthur Ashe, Keith Haring, and Michael Bennett were just a few of the luminaries whose best work was yet to come before they were felled. Last year ground was broken on a planned AIDS memorial in the West Village to complement the comparably tiny one that cowers near the foot of Bank Street on the Hudson River. What’s taken so long? One could argue that the gay demimonde most likely to bring such a memorial about were themselves either suffering their own form of PTSD (tell me if watching your young friends die doesn’t have an effect), or succumbed to the disease themselves. Shame was a likely deterrent: our permissive, live-and-let-live reputation notwithstanding, the stigma of AIDS trumped the lives lost, just as the presumed sexuality of the victims prevented indifferent city officials from taking action when the virus first took hold. Right now the “footprint fountains” in downtown Manhattan are anything but contemplative. As a monument to tragedy, only time will tell if its emotional heft lingers long after we’ve ceased to be overwhelmed by its size, or its current drawing power as a tourist attraction lasts. Grief is a tricky thing that grows even more complex when the personal and the public conjoin; I can’t wait to see how the West Village AIDS Memorial wrestles with this paradox.